Q. For the past few weeks I have had yellowing then drying leaves on my tomato plants. there isn't much else to say about it...Here are a couple photos I just took of a leaf. A. Some yellowing and browning on lower tomato leaves is normal. Tomatoes are annuals. Their growth cycle is for one season. As they mature, they put their energy into new growth (additional stems, leaves, blossoms, and fruit.) The older growth is a lower priority! Having said that, if you've had extreme temperatures, or inconsistent watering, those factors contribute to stress on the plant. The lower leaves are the first to feel the stress and they often react in a way that shows they do not appreciate it. Further, your leaves show definite lines of yellow. This could mean that parts of the leaves are not getting proper nutrition. Make sure your plants are getting a balanced fertilizer every 2-3 weeks. Further, too much nitrogen in your tomato fertilizer can mean leaf tips brown. 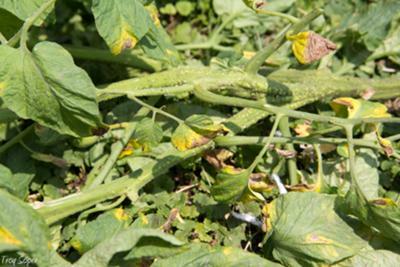 These photos also look as though they were taken just as the plants began to exhibit yellow leaf symptoms. 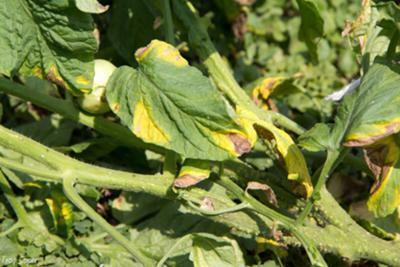 Check plants further and compare those symptoms to those for different kinds of tomato blight.